American Bobtails have short tails about one-third to one-half the size length of a normal cat tail. The breed also has almond-shaped eyes, which give them a wild appearance. The hind legs are longer than the front legs, and the paws are large and round. Longhaired American Bobtails have medium-long hair with a double coat. The shorthaired variety is also double coated. 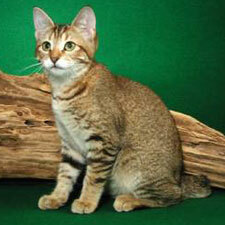 American Bobtails come in all cat colors and patterns, including tabby, solid and tortoiseshell. American Bobtails are known for being friendly and playful. They are also active and very intelligent. They are famous for being escape artists. American Bobtails like affection, and can be vocal when asking for it. They get along with older kids and well-behaved dogs. American Bobtails are often thought be related to wild bobcats, but a genetic link has never been proven. This breed is good at getting out of carriers and closed rooms. American Bobtails born without tails (which sometimes happens) may have health problems caused by a too-short spine. Because breeding for these characteristics proved very difficult, breeders eventually began allowing any color and marking in their programs. The breed’s short tail remained its signature characteristic. The breed is now accepted by The International Cat Fanciers Association (TICA) and the American Cat Fanciers Association (AFCA) as two separate longhaired and shorthaired varieties.